A descendant of strong working East German DDR bloodlines and nicely bred from the blood from the well known Grafental kennel, Biehla is the product of our litter out of our Schh3 female Franzi vom Gräfental, sired by our own Renown East German Stud Dog Lux vom Kameruner Eck, both of whom were imported directly from Germany. 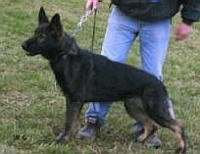 Biehla's excellent producing sire Lux vom Kameruner Eck. is V Rated, Sch3, KKL1 for Life. Imported from Germany, Lux's pedigree is an excellent working lineage of Pure DDR/ East German bloodlines. Lux is an extreme quality male with very good work ethic demonstrating super bitework, super retrieve, and confidence on slick floors. Well focused on the work and easily handled, He is a large boned, substantial male with an excellent large blocky head that the DDR dogs are so well known to possess and pass along into their offspring. He possesses a deep, richly pigmented dark black sable coat which he has consistently passed along to his offspring. His drive for the ball is intense and lightning fast, and in protection work he comes at the helper like a rocket, with excellent civil and defensive drive. 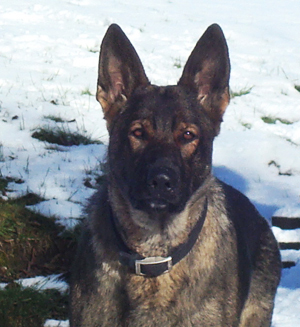 Lux's temperament is very solid and he is an attentive dog to the handler. He is, at all times, agreeable, ready and willing to work. In addition to the excellent bloodlines Biehla inherits from her sire line, she also inherits the incredible and well known blood of the Gräfental kennel from her mother line in Franzi vom Gräfental, Schh3, KKL1 and "V" rated in working structure with Hips "A1" Normal. Franzi also brings in the excellent blood for tracking, protection and serious bitework qualities from the great DDR sire, Lord vom Gleisdreieck, making this a line breeding of 3-5 on this great DDR dog. The qualities Biehla is demonstrating from this strong working bloodline combination are very good natural suspicion and correct assessment of a possible threat...intense and solid courage and good ball drive. 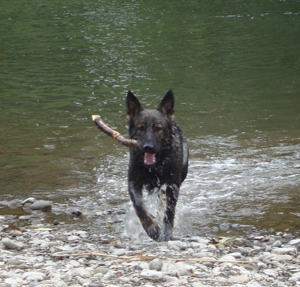 Like her father Lux, Biehla LOVES the water, and is an excellent and strong swimmer with a high degree of athleticism. 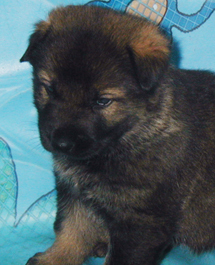 She has rich, dark pigmentation of coat coloration in black sable coat pattern. Demonstrating courage and super strong nerves, high prey and retrieve drives, w/ strong presence of excellent tracking ability. 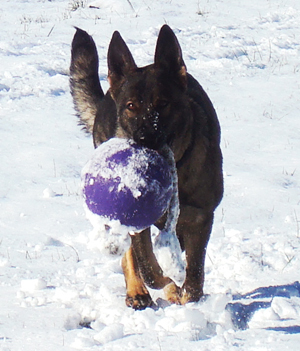 She has excellent natural herding instinct, and has received her HIC and HCT certifications in herding. Her character is sure and devoted, and she is focused, outgoing & happy when interacting with people.